Gas is injected and withdrawn from the Ahuroa reservoir from 4 wells 2.4 to 2.7 km deep. Gas is received from and injected into the Transmission System at the Stratford 3 bi-directional point. Gas to be withdrawn or injected is conveyed to and from the field via an 8.7 km long, 18” (450mm) diameter steel pipeline. This pipeline has an operating pressure of around 45 bar and a maximum operating capacity of 170 TJ/d. Injection compression is provided by a single-train GE compressor rated to 17 TJ/d. 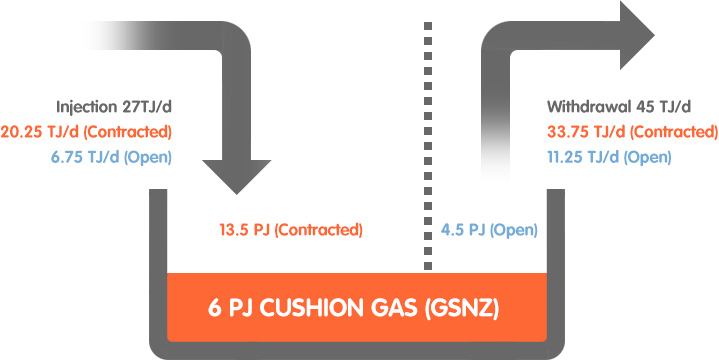 Additional compression is provided by looping to the Waihapa Production station which boosts compressor inlet pressure and injection capacity to 27 TJ/d. This equipment is operated by NZEC who own and operate the Waihapa Production station. Future expansion of the surface facilities will increase injection and withdrawal capacity to 65 TJ/d. Gas withdrawn from the field is dried, heated and dew-pointed to ensure compliance with the pipeline specification NZS 5442. Flex Gas can start injection or withdrawal at Ahuroa within 6-8 hours’ notice if the facility is not operating. The facility can switch between injection and withdrawal within 2 hours. These response times provide the level of intra-day flexibility required to respond to changing market conditions.